Lexus hopes to sell 50,000 to 60,000 ES 350s a year in the United States. Prices will be announced closer to the car's August on-sale date, and executives said the sticker should remain close to that of the current model's $37,150, including shipping. Editor's note: An earlier version of this story misidentified the status of navigation availability on the Lexus ES 350. It is an optional feature and comes with a one-year trial subscription to NavTraffic. PORTLAND, Ore. -- Lexus detractors pillory the ES 350 as little more than a rebadged Toyota Camry XLE. But an initial drive of the re-engineered 2013 ES lineup challenges that claim, even though much of the platform and powertrain are shared with the Camry. The basics: The wheelbase matches that of the Toyota Avalon full-sized sedan, rather than the Camry, giving it extra interior roominess. The carryover 3.5-liter engine develops 268 hp and is rated at 21/31 mpg in city/highway driving without modern features such as direct injection. It also runs on 87-octane gasoline. Although it has been panned as a soulless, soporific appliance, the ES 350 zips to 60 mph in 7.1 seconds and turns a 15.1-second quarter-mile time. The carryover six-speed automatic transmission is a bit behind competitors' seven- and eight-speed automatics, but shift quality is smooth. The car's sport mode maintains ride comfort while increasing stability through hard corners, but there is no mistaking the ES for a sport sedan. Notable features: For the first time, the ES line gets a hybrid. The ES 300h uses a 2.5-liter four-cylinder Atkinson cycle engine that delivers power to the wheels via a motor-generator and an electronically controlled planetary gearset that mimics a continuously variable transmission. It is the same system used in the Toyota Camry. For increased body rigidity, Lexus has reinforced the instrument panel, added floor braces and a rear strut bar and used more ultra high-strength steel throughout. Standard features include 10 airbags, 17-inch wheels, SmartKey, and Bluetooth connectivity. The standard 10-way power driver and passenger seats come with faux-leather seating surfaces and improved cushioning for the pelvis and hips. The base model comes with a moon roof, and there's an optional panoramic frameless glass roof that retracts one panel over another. The base audio system includes a CD player, high-definition radio, eight-channel digital amplifier, auxiliary jack, satellite radio hookup and eight speakers. For drivers who forget their high beams are on at night, the ES 350 automatically dims them when headlights or taillights are detected ahead. The optional blind spot monitor system detects objects from the rear bumper when backing out of a parking space. 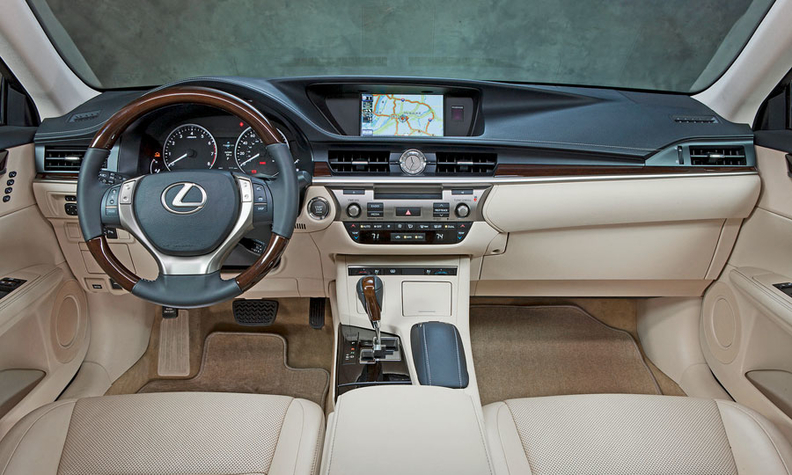 The interior paneling on the hybrid edition includes bamboo wood trim. 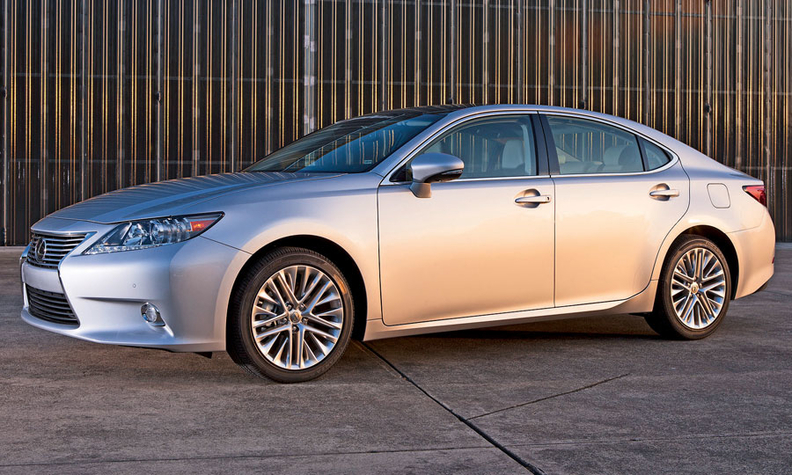 The new Lexus ES 350 is 1.6 inches longer than the version it replaces. Wheelbase 111.0 in. 109.3 in. Length 192.7 in. 191.1 in. Width 71.7 in. 71.7 in. Height 57.1 in. 56.3 in. Curb weight 3,549 lbs. 3,580 lbs. EPA mpg 21 city/31 hwy. 19 city/27 hwy. The ES 350's instrument panel and center stack share design language with the upmarket GS sedan, but the ES version seems to have less content and has a clunky array of buttons. What Lexus says: "I wanted to design a truly global ES," Toshio Asahi, ES chief engineer said at the media introduction here. "Every decision was considered from a global perspective." Compromises and shortcomings: The instrument panel and center stack share design language with the upmarket GS sedan, but the ES version seems to have less content and has a clunky array of buttons oddly reminiscent of a 1980s stereo receiver. The rear seats don't fold down, which is great for lateral stability but lousy for Home Depot runs. The optional 18-inch wheels create substantially more road noise. Normally, Toyota's mileage estimates for its hybrid models are dead on, but despite its claimed 40 mpg, the ES 300h returned only 34 mpg on a 90-minute loop driven sedately. The market: Globally, Lexus hopes to sell about 100,000 units a year, 50,000 to 60,000 of them in the United States. Prices won't be announced until closer to the car's August on-sale date, but executives said the sticker should remain close to that of the current model's $37,150, including freight. Still, with the strong yen and more content, expect some price bump. The marketing launch will carry the tag line "Unforgettable" and will attempt to change preconceived opinions about the ES and Lexus in general. Commercials will focus on the style of the car's interior and exterior. The skinny: The ES is evolutionary and lacks some of the technology leaps of its rivals. The center stack layout is a disaster. But the ride is smooth, and the engine has good power. It likely will retain a good chunk of the buyer base that loves Lexus' customer service and perfectionist engineering -- but good luck trying to conquest someone out of an Audi A4 or BMW 3 series just because the ES is larger.